The RIVER-F Plus provides you with the latest high-resolution technology and technical specifications and discrimination. GER DETECT places the high technology in this device to be the first to search and explore water. 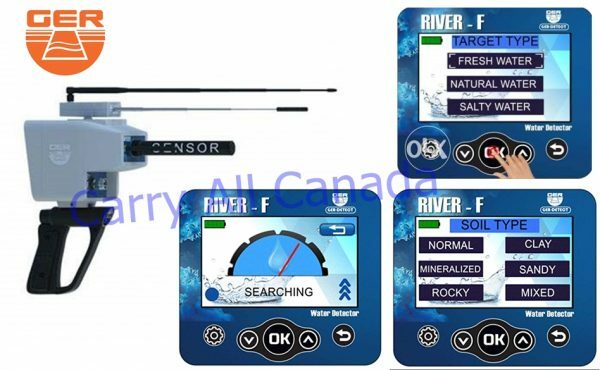 The RIVER-F water Locator allows users to operate two systems: the touch system and the keyboard system. The user can choose the type of soil desired in the search area: (Natural-clayey-Rocky-Sandy-mixed, and mineral). This feature is designed for the user to get more accurate results. It works with lengths of up to 3000 square meters and 1200 meters deep. The device allows the user to select the appropriate length of the search area to be covered (500-1000-1500-2000-2500-3000) square meters. It has a digital compass to help the user set the directions North and south. Touch screen to display full search data. The maximum depth of the device is up to 1200 meters. Length up to 3000 meters with the possibility of determining the desired length. Certificate of origin and warranty for two years from the date of purchase. First class equipment of industry of Germany. Total weight of the device with accessories (6 kg).